San Francisco (Obama.net)- Nine years ago on this day, the Twin Towers in New York City, New York were attacks by terrorist forces known as al Qaeda. The attacks destroyed both buildings, but more tragically took the lives of nearly 3,000 people with them. While three thousand may have lost their lives, millions had their lives torn apart due to the events, and an entire nation was shook. It’s hard to remember the events of 9/11 without mentioning what happened as a consequence of the attacks. That day led to two wars being started by former President George W. Bush, which in turn led to changes in the American economy and eventually an economic crash and crisis. 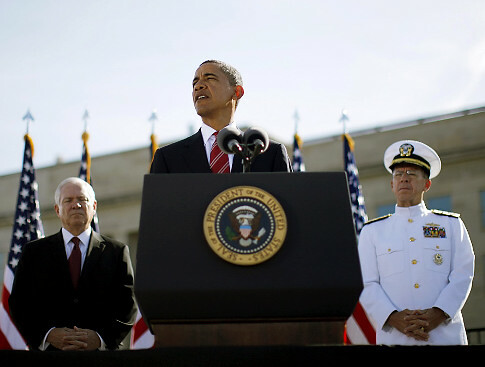 This year, President Barack Obama once again honored the date at the Pentagon. Thousands came together near the memorial for the victims of 9/11. Moments of silence were held at 8:46 am and 9:03 am to mark the times that the towers were struck. The Vice President of the United States was also at the New York City memorial and read a poem. Other American citizens spoke out, remembering the ones they lost on that tragic day nearly one decade ago. As the tragedy of 9/11 is become an older date as time goes on, the healing process is moving on as well. While nothing can be done to bring back the three thousand people who were lost on that day, there is now more acceptance among those affected. As time continues to progress, the healing will continue to grow as well, but one thing that will not fade is the memory of that day.